How can you improve gap selection? Home › Advice › What is gap selection and how can you improve your skills? Gap selection occurs when the driver looks at approaching traffic and decides that there’s enough space to complete a manoeuvre or action. For example, chooses to turn, overtake, make a u-turn or change lanes into a gap in the traffic, or chooses to open their car door in front of a cyclist or other vehicles. Inexperienced drivers can struggle with gap selection. It’s particularly important at intersection where getting it wrong could mean your vehicle is t-boned by another vehicle. What is an unsafe gap? You turn left out of a side street into a main road and traffic on the main road has to brake to avoid you. You move into the lane next to you without checking your blind spot and without giving enough warning to other drivers. If a gap isn’t large enough it’s OK to wait until it’s safe. Don’t be pressured by other drivers. How can you make gap selection safer? Clearly signal your intention when changing lanes: this allows other drivers to anticipate your move and let you in if traffic is heavy, but don’t take for granted that this will happen; you still need to choose a safe gap. Don’t judge traffic’s distance and speed solely using your mirrors – take a look over your shoulder to check your blind spots. Don’t dawdle: when you’re turning across traffic or into a traffic flow, get up to speed quickly but safely. When turning across a road with two or more lanes check for and anticipate blind spots that might be hiding a motorcyclist or cyclist. Use median strips where they are available to help with your turning. If you are pulling back onto a motorway after stopping on the hard shoulder, use the hard shoulder to get up to the same speed as the motorway traffic. When merging from an on-ramp, match your speed to the traffic already on the motorway. When opening your car door, try opening it with your left hand so that it forces you to turn around and take a better look. Know the performance of your vehicle. Some vehicles can take a while to get moving (they’re slow off the line). Know the length of your vehicle. Towing a trailer means you’ll need to wait for a larger gap as you will take longer to cross traffic, and you’ll need a longer gap if moving into another lane. Know the weather and the grip on the road: wet weather and an uphill exit from an intersection will increase the risk of wheelspin and reduce your ability to build speed quickly. Check that there are no pedestrians already on the road where you want to turn. Check that no traffic is blocking your exit on the road where you want to turn. Motorcyclists should pay attention to metal manhole covers which can be more slippery when turning. When overtaking make sure that you can see at least 100m of clear road ahead of you at all times, including when you’ve finished your overtaking manoeuvre, and ensure that there’s a gap in front of the vehicle you’re overtaking that you can move back into. If you drive a manual vehicle, knowing how to move away swiftly without stalling is important – it’s extremely dangerous to stall half way across an intersection. What makes selecting a gap more difficult? Due to a phenomenon known as velocity transposition, which is part of the illusion of velocity and size, the larger the vehicle, the slower it appears it is moving. You’ll probably have seen this when watching a large plane come in to land. Even though it’s travelling at more than 200kph, it doesn’t appear like it’s moving that fast. This applies to vehicles like large trucks. A truck approaching at 90kph appears to be moving more slowly than a small car approaching at 90kph. Therefore the risk is that you pull out in front of the truck because you don’t realise how fast it is approaching. It’s more difficult to judge gaps when it’s dark and you are relying on headlights, particularly if the vehicle only has one headlight, like a motorcycle. It’s also harder to see less-visible road users like cyclists when it’s darker. In a very open intersection with give way signs it’s likely that you will not have to stop. 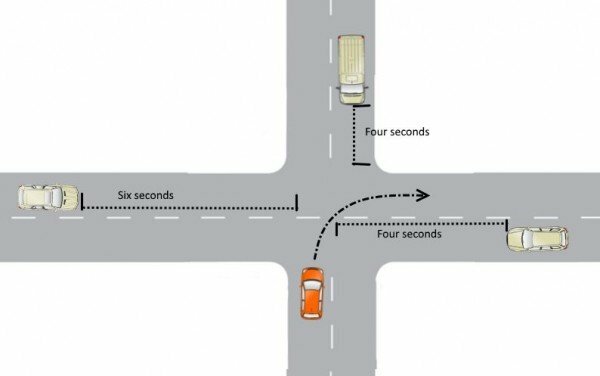 You can use this to your advantage because it will take you less time to get across the intersection as you’re already carrying some speed. However, it also makes it slightly more difficult to judge the gaps while you are moving because you still need to be paying attention to where you are going. If you are turning out of an intersection with an uphill gradient you won’t be able to accelerate as quickly. Looking into the sun makes it more difficult to judge distance and also to even see clearly any hazards. While a left turn is slightly less complex than a right turn because you don’t need to consider traffic coming from your left (just pedestrians that might be crossing), left turns are usually sharper than right turns which makes it more difficult to accelerate briskly out of the corner. As a rule-of-thumb a safe gap is six seconds; if you have a vehicle that has much more performance (e.g. a motorbike or a faster car) and the road is dry, then slightly less gap could be fine, but if you are towing a trailer or you are driving a slower truck or van then you might need slightly more gap. Six seconds at 60kph is around 100m. Bear in mind that if a car is parked on the left then you might need to wait behind it to allow traffic coming from your left to pass it. Even though with a right turn you need to cross more lanes, right-hand turns are usually shallower than left hand turns and that gives you more opportunity to accelerate briskly from the intersection. Remember that by ‘accelerating briskly’ we don’t mean that you should do it dangerously. If you cause wheelspin (other than a small ‘chirp’ off the line) then police might pull you over for ‘sustained loss of traction’, plus you’re risking losing control of your vehicle. With a right-hand turn you need less gap for traffic from the right than with a left-hand turn, but a similar gap from the left. A good rule-of-thumb is four seconds for traffic from your right and six seconds from your left. You will take between 2-4 seconds to get across the road to the other side, depending on the width of the road, the speed of your vehicle, and how shallow you make the curve. If you have to turn across one lane of traffic then you will need three to four seconds from a standing start to be safe. If you are still moving then you have a little bit more time. Ensure that there are no pedestrians crossing the road you’re turning into, and that it’s not blocked by traffic. If you are proceeding straight ahead you will need around three seconds to your right and four seconds to your left as you don’t need to be concerned with the vehicle coming towards you; you just need to get across the traffic. You’ll need more time if you’re crossing a dual carriageway. If you are turning right at a crossroads, then traffic approaching you and turning left will have priority (unless you have a give way sign and they have a stop sign). In this case you will need to allow them a four-second gap. Because that vehicle will be slowing down, the four second gap you leave for it will be much less in terms of actual distance on the road than the four-second gap you leave for vehicles approaching from the right. And now you can see why you have to have enough practice to judge these by sight! A u-turn is difficult because you need to be aware of drivers behind you as well as drivers coming towards you. You must be sure that you can complete the manoeuvre in one turn and not have to reverse, otherwise it becomes a three-point turn and you’ll need even more room for that. U-turns are very tight which means you can’t do them while going fast, therefore you need to leave more space and time to complete the manoeuvre. The safest way to do it is to pull over to the left first to ensure the turning circle of your vehicle has the best chance of being less than the width of the turn you are about to make! Make sure you look over your shoulder before turning so you can see any cyclists or vehicles in your blind spot. A better option than a u-turn on a busy street is to find a side street on the right, turn into that, then do a three-point turn where it’s safer. Read our advanced guide to overtaking. If it’s not possible to turn right because there’s too much traffic, turn left then turn right into a side road, do a u-turn or three-point-turn, then go back to the main road and turn left. Traffic might let you in if it’s quite slow. You might see a driver flash their lights. This doesn’t necessarily mean they will let you in, but could do. Look for them gesturing you with their hand and hanging back creating a gap. Try to make eye contact to confirm, and give a friendly wave. If traffic has stopped then be very careful of cyclists travelling down the left of the line of traffic. If you are turning right through a gap in stationery traffic there will be a large blind spot up the line of traffic so emerge carefully. How do you get better at gap selection? It’s a skill that comes with practice. The more you practice, the better you become at judging the distance. It’s impossible to ‘count’ the six second gap because by the time you have counted, the gap is gone. Therefore practice is essential so that you become able to instantly judge whether a gap is safe or not. The first exercise is to get used to what gaps look like without putting yourself at risk. You need to find a T intersection on a reasonably busy main road where there are lots of vehicles turning right from the top of the T, and lots of vehicles turning right and left from the bottom of the T. Rush hour is not a good time to do this as you want to have the vehicles flowing freely at 50kph. Park your car a safe distance away and walk to the intersection. Position yourself on the footpath at the top of the T intersection so that you can see both the right-turning vehicles from the top of the T and the approaching traffic. Time the traffic either using your watch or counting one-thousand-and-one, two-thousand-and-two, etc to mark one-second intervals. See roughly where six seconds would be on that road. Watch as many as you need to until you start to feel comfortable that you can guess the gap. Now you need to repeat this process for the other two scenarios from the bottom of the T. Stand on or near the left-hand corner on the pavement so that you can see the traffic turning out of the T as well as traffic from both directions on the top of the T. Again, watch as many as you need to in order to feel comfortable about the gap. Watch how different types of vehicles choose different gaps. You might see some narrowly avoided collisions. See if you can tell when a person has made an unsafe gap choice by pulling into the traffic and causing other vehicles to brake. As a passenger in a car with an experienced driver (preferably one with 5+ years of driving experience) or a driving instructor, get them to show you how to judge gaps at that intersection. After doing this 5-10 times, discuss how you felt about them. Did you feel some of them were too close? How did they judge the gap? Now you are used to that intersection, return with an experienced supervisor or driving instructor and give it a go yourself. You’ll need to do a few of these, e.g. 5-10. Once you’ve done them, ask the supervisor or instructor whether there were any times when you waited far too long, or when you turned into an unsafe gap. With your supervisor or driving instructor try some other intersections. As you build up your confidence make them more and more difficult including busy crossroads, intersections where you have to exit on a hill, and so on. 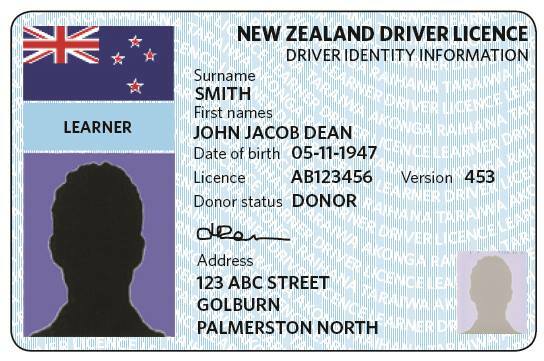 ‹ When will I get my learner licence?